Debate season, week two in the presidential campaign opened with eight new polls from seven states. Together, most of the survey data seemingly indicated a continued narrowing between the two major party candidates, particularly in the toss up states. What is interesting is that while the post-convention period polling drew some lines of demarcation between some toss up states/groups of toss up states, said lines are being redefined now. For instance, among the toss up states, there was some marked separation in the FHQ weighted average margins between Florida/North Carolina and Colorado and then between Colorado and Iowa/Virginia. That Iowa/Virginia pair had gradually drawn closer to the tipping point state of Ohio, the margin in which had widened as well. But in the time since the first debate, there has been not only a reversal of that widening across the most important states in the electoral puzzle, but a compression in terms of the resulting polling averages. In other words the states are becoming competitive and those former lines of demarcation between states is disappearing. Though Obama topped or met the 50% mark in about half of the post-convention polling in the Centennial state, the president has more or less performed at or around his FHQ average share of support. The changes/narrowing there have/has been is more about the Romney side of the equation. Just before and in the time after the debate, the governor has more consistently pulled in a share of polling support above his pre-existing weighted average. And that is in line with this notion that there is continued compression in the toss up states. The same is not necessarily the case in Iowa. Methodologically/statistically speaking Iowa has been slightly more volatile from poll to poll and its average has oscillated a bit more due to a lack of polls relative to the other toss ups. The pattern is less clear, then, in the Hawkeye state and we need more post-debate data to get a firm grasp on where the state of play is there. Close, yes, but how close is the question. Hey! Some Louisiana polling data! Oh, some Louisiana polling data. Yeah, it's good to have something out of the Pelican state, but the information we did get from Magellan did not really break from the conventional wisdom that Louisiana is safely red for Romney and the Republicans. Sure, FHQ could draw a connection between Massachusetts and Louisiana because the outlook in each is the same -- solidly in one camp or the other -- but there has been much more data out of the Bay state. That hasn't made things any less clear there. We know Massachusetts will be an Obama state on November 6. There is, perhaps, a similar outlook in Michigan, but it is certainly less strong than in Louisiana or Massachusetts. And that is a reasonable conclusion given that Michigan has been consistently blue throughout, but has spent some time as a toss up state in our averages. These two polls point toward some tightening, but do little to change the fact (given the information we have now) that Michigan may be trending more competitive, but is still likely to end up in the president's column on election day. See Michigan, but with the caveat that Pennsylvania has been slightly less competitive in 2012 polling of the Keystone state and that it was never a toss up as FHQ has measured it. That said, there is going to have to be additional, similar and consistent data in the Obama +2 range to bring Pennsylvania into a strategically competitive area for Romney. ...and that is not to say that that cannot happen, just that it hasn't yet. We still don't have enough to go on post-debate in the Old Dominion, but this latest PPP survey did not change the FHQ average margin there at all. Both candidates outperformed their average shares of support but were still separated by a margin approximating the FHQ weighted average margin. The separation that had developed between the groups of state mentioned at the top of this post might be disappearing but the ordering of states has remained largely unaltered. However, while that's true, if the compression continues, it is all the more likely that these states all become interchangeable to some degree. The order becomes less relevant as the toss up states cluster and more likely tip to one candidate or the other en masse (or split in less predictable ways/combinations). 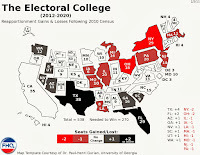 To this point, it should be noted that the majority of FHQ toss up states have tipped toward the president in the time since we began putting up daily electoral college updates in July. 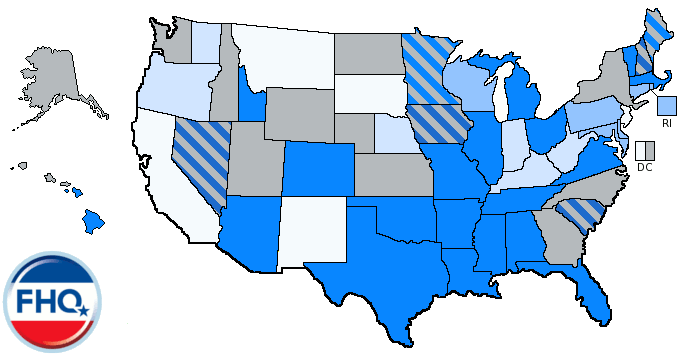 This is a longwinded way of saying that there has been a change in direction of the trajectory of polling in the toss up states since the debate (and arguably a little bit before it), but that has yet to manifest itself in any noticeable way in the various FHQ graphical depictions of the race. 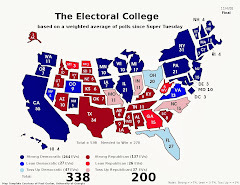 The map above, for example, still shows the very same 332-206 electoral college count that it has shown all along. 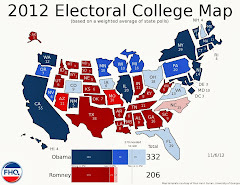 And sure, Massachusetts may have flip-flopped positions with Maryland again and Louisiana may have leapfrogged three states deeper into the Romney column, but among the states that will decide the final breakdown on the electoral vote tally -- the middle column in the Electoral College Spectrum below -- there has been no movement. Where we can begin to or appreciate the movement that is occurring is perhaps on the ever-changing Watch List. Most consequentially, we have witnessed first Virginia and now Iowa slip off the list into a firmer position within the Toss Up Obama category. Neither is seemingly threatening to shift into the less competitive Lean Obama category now that the trajectory of polling has changed. As such, less competitive states like Indiana, Minnesota and Montana are not particularly worthy of watching -- despite being on the list -- but Ohio moving off the list and Nevada switching from a lean state on the verge of being a toss up to a toss up within a fraction of a point of being a lean state are certainly states to keep tabs on.